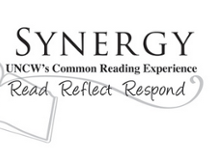 Synergy, UNCW's Common Reading Experience, provides exciting performances, lectures, films and discussions throughout the fall semester that stimulate intellectual curiosity, critical thinking, service, thoughtful expression and much more, centered around one novel each academic year. The 2016 Synergy selection, “Little Bee” by Chris Cleave, tells the fictional story of a young Nigerian refugee and her quest for asylum. While the majority of Synergy’s programming series events are for students, Synergy will host “‘Little Bee’ to NC: Working with Refugees” from 5:30-7:30 p.m., Nov. 14 in Cameron Hall, room 105. The event is free and open to the public. “This networking event will bring together students, alumni and local employers to learn about the refugee population in Wilmington, and about volunteer and career opportunities working with refugees,” said Career Development Counselor Sarah Crockett. Community partners will include the Interfaith Refugee Ministry and the Carolina Refugee Resettlement Agency. Attendees can learn about ways to become involved within the Wilmington community as well as throughout the state of North Carolina. Participants can expect to be challenged to view things from a perspective other than their own and encouraged to take part in making a difference in our community by participating in insightful and meaningful conversation, and translating that conversation into action.